One of the nation’s top health care providers, Asante uses advanced technology for diagnosing and treating patients in Southern Oregon. While doctors, nurses and administrative staff provide high-quality health care, the facilities team makes its own rounds, checking that the building’s operating systems run efficiently. If equipment shows signs of inefficiency, the team contacts Energy Trust of Oregon for help. Previously, Energy Trust helped Asante make major lighting upgrades at its Rogue Regional Medical Center in Medford and Three Rivers Medical Center in Grants Pass. “Energy Trust showed us how energy-efficient upgrades in a health care setting can improve employee productivity and patient satisfaction,” says Neff Clark, Asante facilities manager. So, when Ashland Community Hospital diagnosed an inefficient air handler, Asante teamed up with Energy Trust again to treat the problem. The custom HVAC project included a new 30-ton direct expansion cooling unit that filters outside air and moves it into the conditioned space. 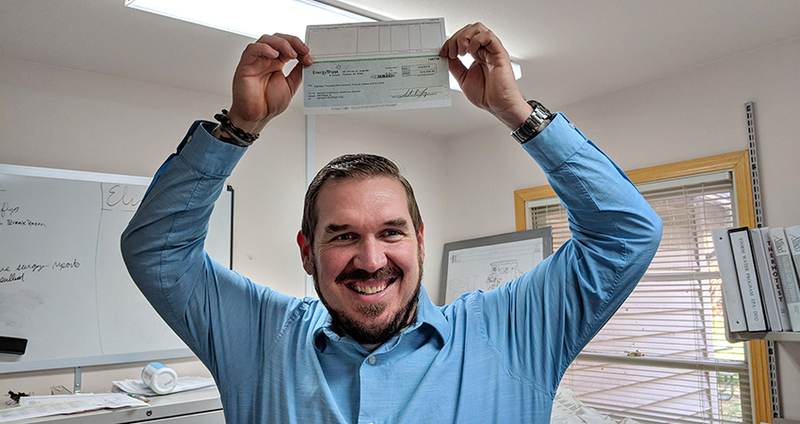 Energy Trust worked with the City of Ashland and Bonneville Power Administration to conduct an energy study to identify waste and potential savings. The new air handler will cut annual energy use at the facility by nearly 6,300 therms—shaving $4,700 off its annual Avista gas bill. Cash incentives from Energy Trust reduced Asante’s upfront equipment cost by $19,000. Asante realized the impact of these upgrades goes beyond energy efficiency. By working with Asante to maximize energy savings and cash incentives, Energy Trust helped advance the organization’s mission of providing high-quality health care. “Energy Trust worked hard to find us more ways to save on our upgrade,” Clark says. “We kept the project within budget while reducing our carbon footprint and increasing comfort for patients and employees.” Clark and his team are looking forward to working with Energy Trust on phase two of these upgrades and on additional projects at the hospital. Energy Trust provides technical resources and cash incentives for energy improvements like this one at sites served by Portland General Electric, Pacific Power, NW Natural, Cascade Natural Gas and Avista. To find out more about HVAC incentives, visit: https://www.energytrust.org/upgradeHVAC.